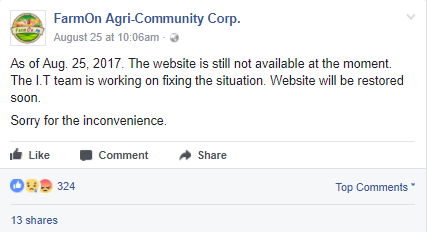 I have been quiet and did not post about what is happening on farmOn's website for days or a week already. It is too technical for me to comprehend [I guess]. A lot of I.T. specialists had been commenting on farmOn's Facebook page about the issue, and here I am, reading about people's reactions there. Some are angry, some are doubtful, some are concerned / worrying and some still trusts and leaves everything on farmOn's technical hands to resolve the issue. 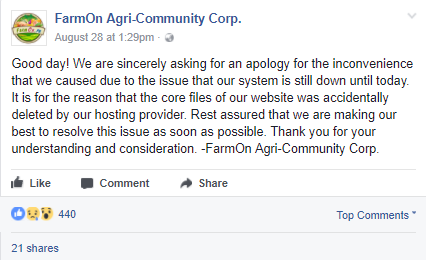 As we have experienced for the past days, farmOn's website cannot be reached. When I first visited the site that day, Bluehost server blah..blah.. appeared. I presumed it was about time to renew their hosting services from Bluehost so I just shrugged it off. The next time I visited their website, it already turned to "Site can't be reached". 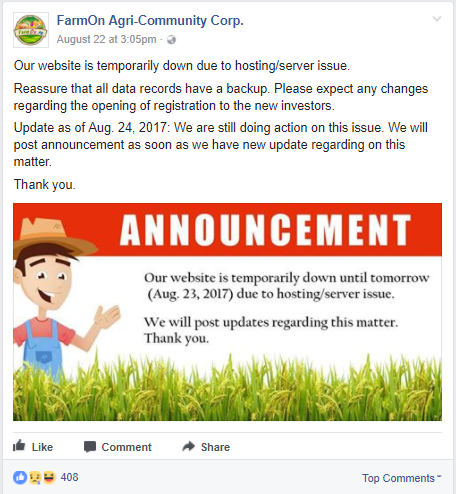 I chatted farmOn on Messenger to inquire about this issue, and they said they are having some server issues and their I.T. team is working on it. They posted an announcement on their Facebook page the next day about this and gave a date of August 23 for this issue to be finally resolved. August 23 had passed, the site still can't be reached. A lot has been commenting on their page. Everyday I check back if their site is already back but it is still not working. 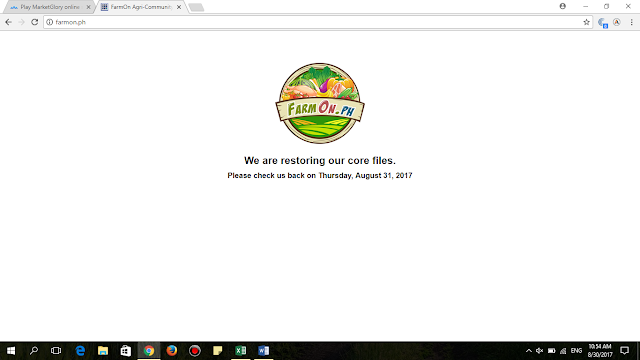 Well, at least when I checked today, they have this little announcement in their website to check them back tomorrow, August 31 and that they are restoring their 'core files'. For now, I will just wait for tomorrow to come and let us see if the site is already back and working.